These Viproo Hair Cutting Scissors are intended for hair thinning, therefore, they have 18 micro-teeth on one blade and bevel edge on other blade. They are made of stainless steel which is known as durable and long-lasting material, therefore, these shears provide durability and longevity as well. These hair thinning scissors are 6.5 inches long and their total weight together with hair clip is 3 ounces. They have no tension adjustment system and no finger inserts, but they are equipped with non-removable finger rest which helps to relieve the stress which usually accumulates in hands and shoulders, causing such symptoms as stiffness, aches, pain, cramps or even occupational diseases. These Viproo hair shears also do not come with any storage case, therefore, if you need some case for you tools, you have to buy it separately. This Viproo set includes not only hair thinning scissors, but also special hair clip with level which helps to cut perfect hair bang. At first glance these Viproo hair cutting scissors look like ordinary scissors which usually are used for cutting of paper or fabric, but when we look closer we can see that they have several micro-teeth on one blade which means that they are intended for hair thinning. They have polished silver color blades and pink plastic handle with non-removable finger rest. As their handles are made of soft plastic there is no need for rubber finger inserts. Talking about hair clip which comes in set, it is pink and has comb-like relief for hair fixing before cutting. This hair clip also has air level which helps to cut perfectly straight hair bang. As mentioned before, these Viproo Hair Cutting Scissors are intended for hair thinning, but they are great for creating layers, trimming bangs, cutting children’s hair, maintaining hairstyle between cuts and doing hairstyle as well. This product is not meant for professional purposes, but we have to admit that it is not really suitable for amateurs as well – even beginners have to practice to cut hair with this set to do this independently and perfectly. These Viproo Hair Cutting Scissors are intended for hair thinning, but you can perform a lot of other actions with them as well, for example, create layers, trim bangs, cut children’s hair, maintain hairstyle between cuts and do hairstyle. They are made of durable stainless steel and they have micro-teeth and bevel edge blades. These Viproo hair shears are 6.5 inches long and their total weight together with hair clip is 3 ounces. They have polished silver color blades and pink plastic handle. This product is not equipped with tension adjustment system and finger inserts, but is has non-removable finger rest for superior comfort and work ergonomics. 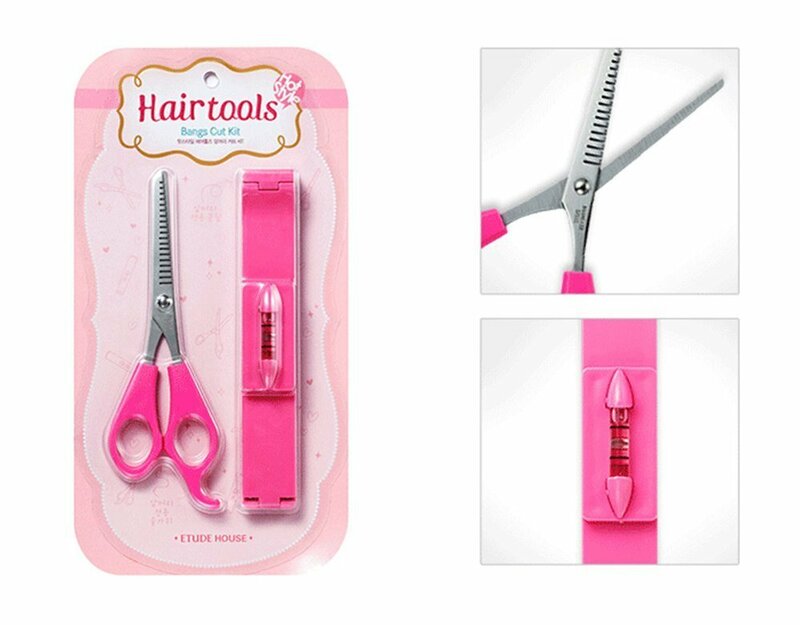 These hair thinning scissors do not come with any storage case, but they come with special hair cut with air level for cutting of perfect hair bangs. This set is more suitable for hairdressing beginners, but it requires practicing.